Brigade Enterprises Limited’s Consolidated Revenues for Q3 FY17 ended 31st December 2016 was at Rs. 572 crores, up from Rs. 459 crores recorded for Q2 FY17. The Consolidated Net Profits stood at Rs. 30.50 crores as against Rs. 28.50 crores, witnessing an increase of 7% over Q2 FY 17. Commenting on the company’s performance, Mr. M.R. Jaishankar, Chairman and Managing Director, Brigade Enterprises Limited, said “Even in these tough market conditions we have been able to increase our revenue by 25% compared to the previous quarter. •EBITDA stood at Rs 141 crores vs Rs 138 crores, an increase of 2%. •EBITDA margin stood at 25% vis-à-vis 30%. •PBT remained same at Rs. 46 crores. •PAT stood at Rs. 30.50 crores vs Rs. 28.50 crores, an increase of 7%. •EBITDA stood at Rs 404 crores vs Rs 395 crores, an increase of 2%. •EBITDA margin increased to 27% vs 25%. •PBT stood at Rs. 127 crores vs Rs. 176 crores, a decrease of 28%. •PAT stood at Rs. 79 crores vs Rs. 99 crores, a decrease of 20%. •Real Estate space aggregating to 0.3 million sq. ft with a total value of186 crores was sold during the third quarter ending 31st December, 2016. The average price realisation was Rs. 6,210 per sq. ft. Sales was severely affected due to the negative sentiment of Demonetisation on the real estate sector. •Lease Rental and Hospitality segments contributed Rs. 67 crores and Rs. 51 crores respectively to the consolidated revenues for the third quarter ended 31stDecember, 2016. ◦Set up a Skill Development Centre in Devanahalli for Construction, Hospitality & Retail sectors. 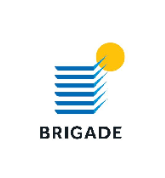 •Brigade REAP – Startup Accelerator, announced strategic partnerships with Microsoft & Intel to benefit Startups in its technology focused Real Estate Accelerator Program (REAP) during November, 2016. •Internationally recognised World Trade Center (WTC) Kochi at Infopark Campus, Kakkanad was inaugurated during November 2016 by Shri. Pinarayi Vijayan, Hon’ble Chief Minister of Kerala. WTC Kochi has marquee tenants such as KPMG, Xerox and others. •Brigade Group’s 4thhotel – Holiday Inn Chennai (200 rooms), is complete and ready for formal opening. •M R Jaishankar has been recognised as one of India’s Best CEO’s and ranked in the Top 100 CEOs by Business Today- PwC in the annual ranking of India’s Best CEOs 2016. •Jaishankar was recognised as a Professional Developer Par Excellence by Association of Consulting Civil Engineers (India), Bangalore Centre for his contributions to the Society at REDECON 2016. •Brigade Group won the Developer of the year – Commercial for Nalapad Brigade Centre at the Realty Plus Excellence Awards (South) 2016. •Brigade Group also won CSR Initiative of the year for the Redevelopment of Sitharampalya Lake at the Realty Plus Excellence Awards (South) 2016. •Brigade Exotica won the Runners Up Award in the High Rise Building category at the 6th Annual Construction Week India Awards 2016. •Also at the 6th Annual Construction Week India Awards 2016 - Mr. Jaishankar won the Real Estate Person of the Year Award, and Ms. Nirupa Shankar won the -Young Entrepreneur of the Year Award. •Aspen@ Brigade Orchards, won the ICI – Birla Super Jury Appreciation Award for Outstanding Concrete Structure of Karnataka 2016 in the Building Category.